We purchased SHR and normotensive Wistar-Kyoto WKY rats from the National Laboratory Animal Center (Taipei, Taiwan). All animals were housed in a temperature-controlled facility (20−22 °C) with free access to water and standard chow on a 12 h light/dark cycle. We used six 47-week-old rats and they were weighed before the BP and ECG measurement. The representative tracings from simultaneous recording of ECG and BP in SHR and WKY are shown in Figure 6. Table 1 shows parameters for BP and heart rate. Statistical (t) tests revealed significantly higher systolic BP and mean BP in SHR (124.5 mmHg ± 15.1 mmHg and 84.3 mmHg ± 5.0 mmHg) than in WKY (90.0 mmHg ± 7.5 mmHg and 67.5 mmHg ± 5.0 mmHg) (P < 0.05) (Table 1). The parameters of P wave, PR intervals, QRS width, and QT intervals can be measured from the ECG recordings (Table 2). Choice of right vs. left femoral cannulation in relation to ECG electrode placement (at the right hind limb) did not affect the BP or ECG signals. Figure 1: Materials. (A) Forceps with teeth, (B) surgical scissors, (C) tissue forceps, (D) tissue forceps with fine tips, (E) angle tip forceps, (F) bulldog vascular clamp, (G) silk string, (H) micro scissors, (I) polyethylene catheter connecting with a 26 G x 1/2” needle and a three-way stopcock (J), (K) pressure transducer connecting with a three-way stopcock, (L) mercury sphygmomanometer with a stopcock (green arrow) and inflation bulb with an air-leak valve (white arrow). Please click here to view a larger version of this figure. Figure 2: Surface landmark for femoral artery dissection. 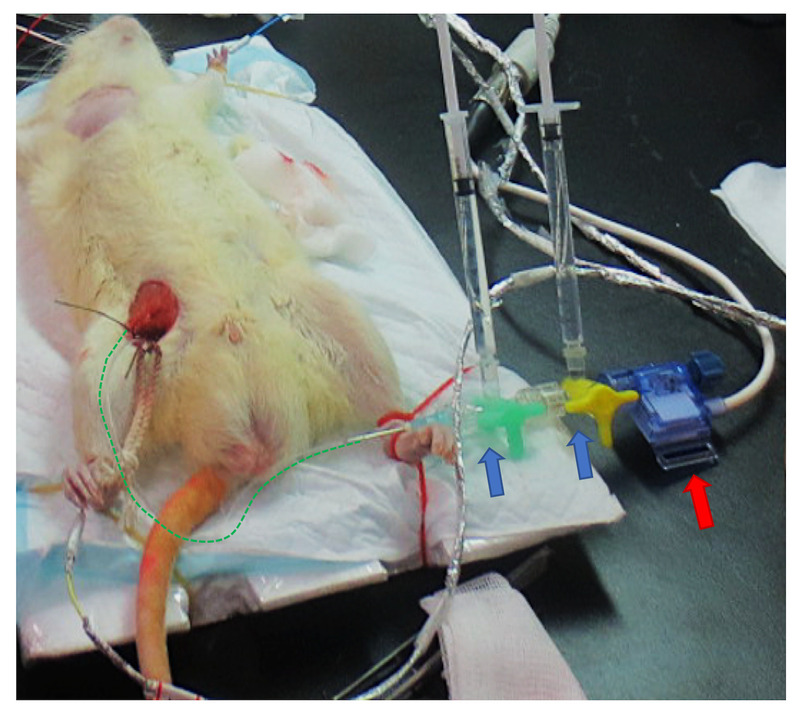 (A) Supine rat with left inguinal crease highlighted with a dashed line. (B) Groin skin picked up by forceps with teeth to be cut off by surgical scissors. (C) The surgical zone for femoral artery dissection. Please click here to view a larger version of this figure. Figure 3: Tissue dissection and cannulation of the femoral artery. (A) Exposed femoral nerve (yellow arrow), femoral vein (blue arrow), and femoral artery (red arrow) after tissue dissection. (B) Femoral vein and artery after the nerve cut-off. (C) Application of a bulldog vascular clamp over the cranial terminal of the dissected femoral artery. 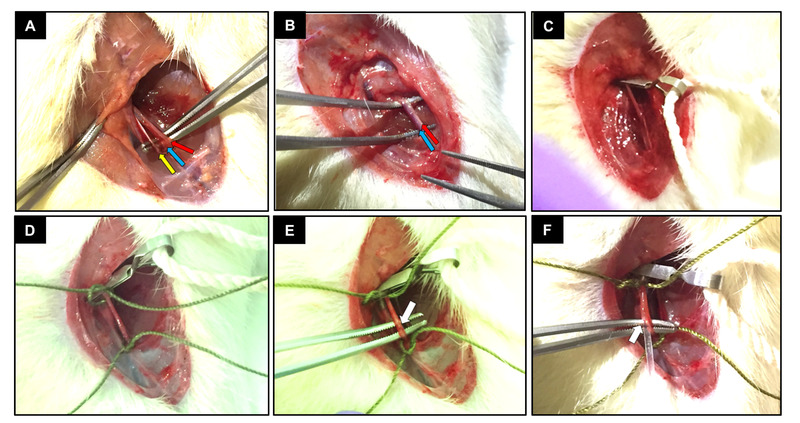 (D) Femoral artery with a bulldog clamp and two silk strings with loose ties. (E) A small hole on the ventral side of femoral artery, created using micro scissors. (F) Insertion of the polyethylene catheter into the femoral artery. Please click here to view a larger version of this figure. Figure 4: Femoral artery cannulation for pressure recording. The intra-arterial cannula (highlighted by a dashed green line) is connected with two three-way stopcocks (blue arrows) with syringes filled with heparinized saline. The pressure transducer (red arrow) is linked to the cannulation through the three-way stopcocks. Please click here to view a larger version of this figure. 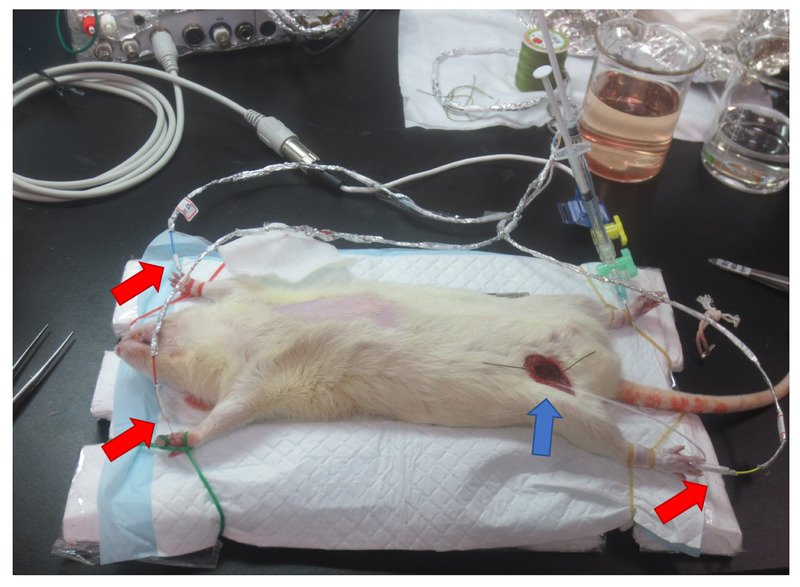 Figure 5: The whole experimental setup for invasive femoral arterial pressure and electrocardiography. Three electrocardiographic leads (red arrows) with platinum needle electrodes subcutaneously inserted over bilateral fore legs and right leg (yellow arrows). The exposed right femoral artery with cannulation (blue arrow). Please click here to view a larger version of this figure. Figure 6: Representative tracings. Simultaneous recordings of ECG and BP in WKY (left) and SHR (right) for the ECG (top), and arterial pressure waves (bottom). Please click here to view a larger version of this figure. Table 1: Blood pressure levels measured by invasive femoral artery cannulation. Data are presented as mean ± standard deviation; SHR = spontaneously hypertensive rats; WKY = Wistar-Kyoto rats; BP = blood pressure. Table 2: Measurements of electrocardiographic parameters. Data are presented as mean ± standard deviation; SHR = spontaneously hypertensive rats; WKY = Wistar-Kyoto rats. This article was originally published by Jove.com. Read the original article here.